Valves are lanceolate and very large with blunt, broadly rounded apices. The axial area is moderately broad and linear. The central area is a rectangular stauros, often narrowing somewhat toward the valve margins. Short striae may be present in the central area. External raphe fissures are lateral. Proximal raphe ends are straight and somewhat inflated. Striae are radiate throughout. Areolae are coarse and number 11-14 in 10 µm. 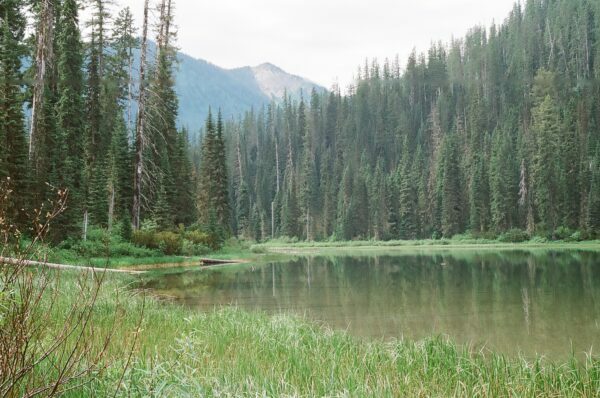 Stauroneis rex is widely distributed in ponds and small lakes in the Northern Rockies. These waters tend to be alkaline (mean pH = 7.8) with moderate concentrations of electrolytes (mean specific conductance = 194 µS/cm). In contrast, Stauroneis phoenicenteron prefers circumneutral waters (mean pH = 7.1) with low concentrations of electrolytes (mean specific conductance = 34 µS/cm). 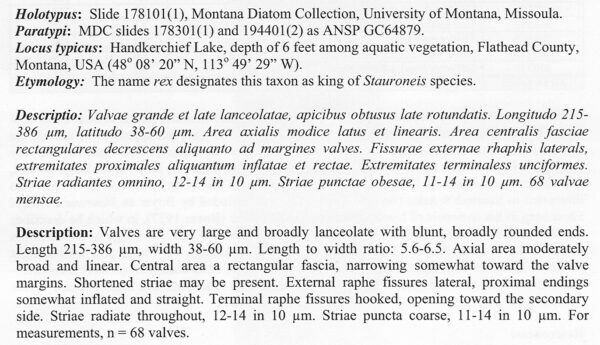 Handkerchief Lake, Flathead County, Montana: type locality of Stauroneis rex. Valves are very large and broadly lanceolate with blunt, broadly rounded ends. Length 215-386 µm, width 38-60 µm. Length to width ratio: 5.6-6.5. Axial area moderately broad and linear. Central area a rectangular fascia, narrowing somewhat toward the valve margins. Shortened striae may be present. External raphe fissures lateral, proximal endings somewhat inflated and straight. Terminal raphe fissures hooked, opening toward the secondary side. 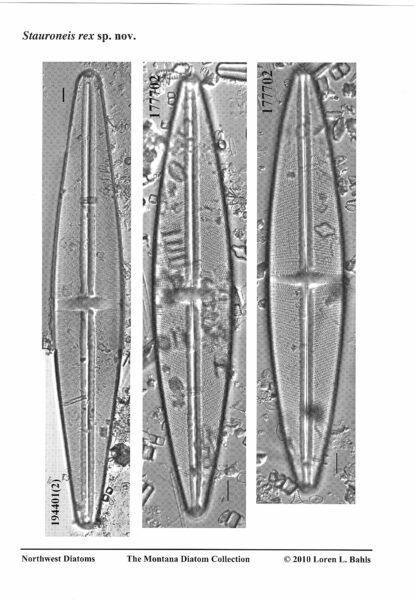 Striae radiate throughout, 12-14 in 10 µm. Striae puncta coarse, 11-14 in 10 µm. For measurements, n = 68 valves. 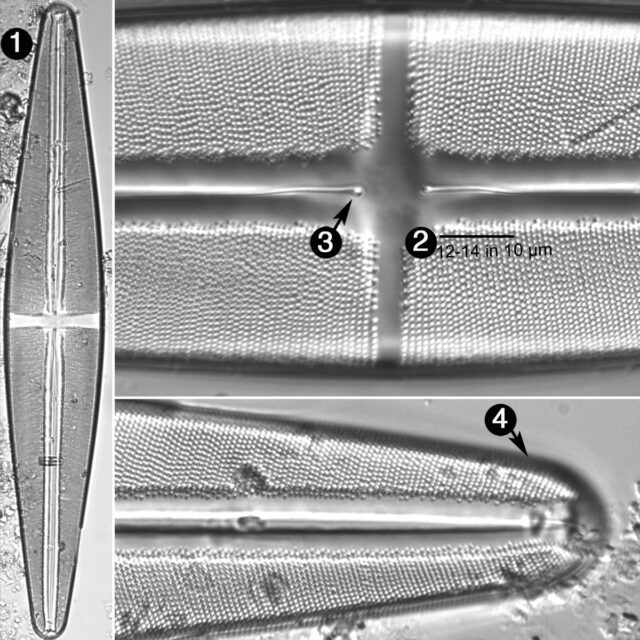 Bahls, L. (2010) Stauroneis in the Northern Rockies: 50 species of Stauroneis sensu stricto from western Montana, northern Idaho, northeastern Washington and southwestern Alberta, including 16 species described as new Northwest Diatoms, Volume 4. 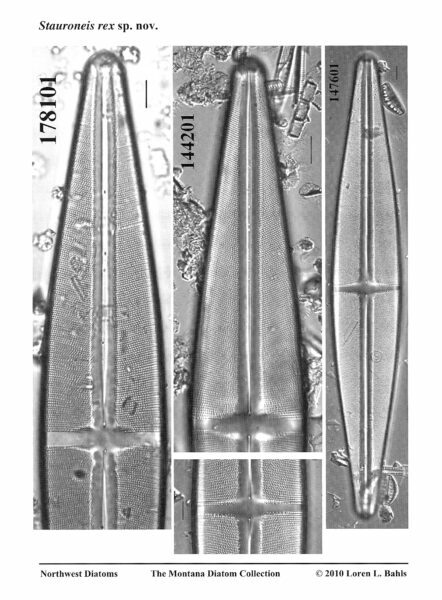 The Montana Diatom Collection, Helena, 172 pp. Stauroneis rex is huge: 36-60 µm wide and 215-386 µm long. Valves are lanceolate with bluntly rounded apices. Proximal raphe ends are straight. Striae are coarse and number 12-14 in 10 µm.